With online luxury sales projected to more than triple by 2025, it’s time for luxury brands to embrace the purchase side of digital: ecommerce. Luxury brands have increased digital ad spend, including on social platforms, by 63% in the last 5 years, but have been slow to warm up to their own direct to consumer ecommerce sites and working with retailers to showcase products online. How can luxury brands adopt to the digital age without compromising the luxury shopping experience? Traditionally, luxury shopping centers around exceptional and highly personalized customer service and the experience of shopping. Luxury has long been considered a “high-touch” experience -- shoppers want to feel the fabric or enticed by spotting the perfect pair bag in a glamorous environment. But as we’ve said before, millennials and Gen Z are forcing brands to reconsider their tactics and modernize -- for good reason, they accounted for 85% growth in luxury sales in 2017. “Millennials and Gen Zs who purchase luxury want much more than just a brand name and a status symbol. They want an experience, which for them has to encompass some form of digital interaction, [and] has to be inspirational,” according to recent research out of Wharton School of Business. For these savvy shoppers, this means an omni-channel experience that captivates them and speaks to their needs. If the industry is behind, what are the brands and channels that have captured the heart of the luxury shopper? Check them out below. Gucci is synonymous with luxury and status -- they have some of the most coveted clothes and accessories in fashion. SIxty-five percent of their business is done with Millennials and were named the Best Performing Digital Fashion Brand in 2017 by L2. They’ve approached the digital space holistically and created an ecommerce site that is inviting, informative and captures the luxury buyers’ hearts. Each product has 9 high resolution, quality images from various angles, including one with a model, a zoom feature to digitally inspect details, and highly informative product details. As a shopper navigates the page, he or she will barely miss the experience of in-store shopping, but still feel taken care of. The Gucci ecommerce team has also incorporated an in-store like salesperson experience directly on the product page: “May We Help?” that pops up with a phone to call, availability online chat (until 10pm) and an email form. The small detail of “May” rather than “Need Help?” illustrates how they’ve brought the best of in-store salesperson experiences to the digital store. For luxury brands wanting to reach a global audience with the same level of attention to detail, poshness and maintain best-in-class customer service, London-based FarFetch, has star power: It has built a digital empire to delight fashionistas and brands alike. From editorially driven pages to express global delivery, including same day delivery in London, New York, Paris and other major cities, it’s easy to understand how it grew revenue by 74% in 2016. Shoppers can filter products by 90-minute delivery and same day delivery when they are browsing. 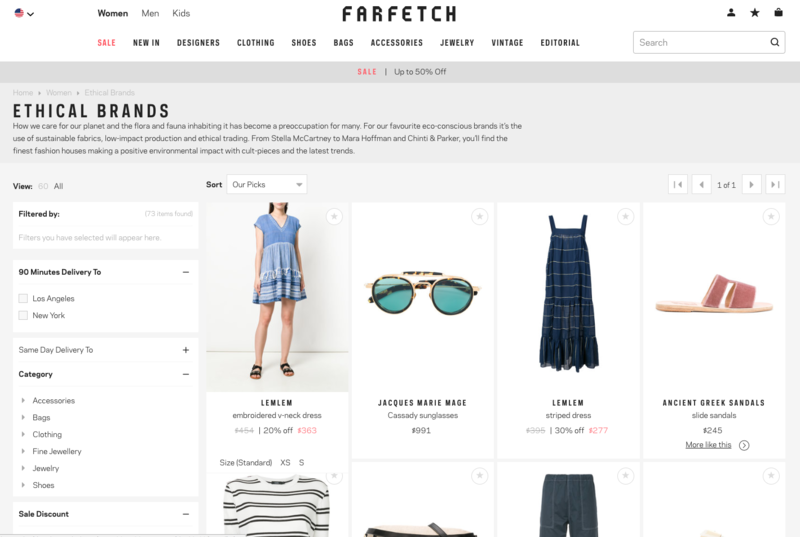 In their editorial-like spirit and understanding the millennial buyer, one of their categories is “Ethical Brands”, FarFetch taps into their target audiences’ desire to know about what they are wearing and wanting to be a more conscious shopper. Each product page has a designer backstory in addition to high quality product detail. These small details make a big impact on a customer experience when it comes to high end pieces. LVMH, one of largest luxury groups in the world, launched 24 Sèvres, a ‘new online shopping experience’ in October 2017. 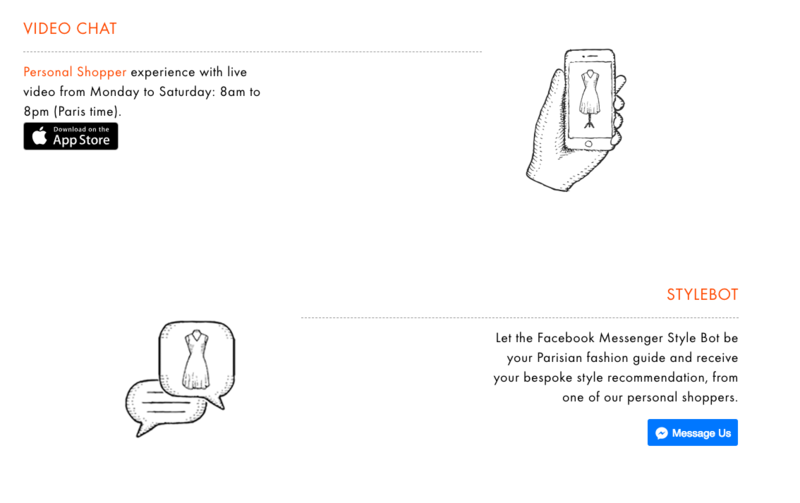 It is the digital version of the famous Parisian department store, La Bon Marche, and it features LVMH brands and its competitors and some unique features including new methods for customer interaction. Chief Digital Officer Ian Rogers, who comes from Apple, spearheaded the effort and wanted to provide something different for luxury shoppers. “Anything you want is already online. Consumers are looking for curators. We are building a trusted collection,” he said. Shoppers can connect with a personal shopper in three ways: via a ChatBot, Video, or through a portal. This level of attention speaks deeply to the luxury shopping experience of the past with an inventive twist. The new luxury shopper can be anywhere and work with a stylist to plan their seasonal wardrobe.